The best player on planet earth, for those who believe in that point of view, their opinion was endorsed on Sunday 3rd June in the final of the Men’s Singles event at the Seamaster 2018 ITTF World Tour Platinum Kaisa China Open in Shenzhen. Ma Long, the no.5 seed, beat Chinese national team colleague, Fan Zhendong, the top seed, to arrest the precious title. He won in five games (7-11, 11-8, 11-4, 11-3, 14-12). 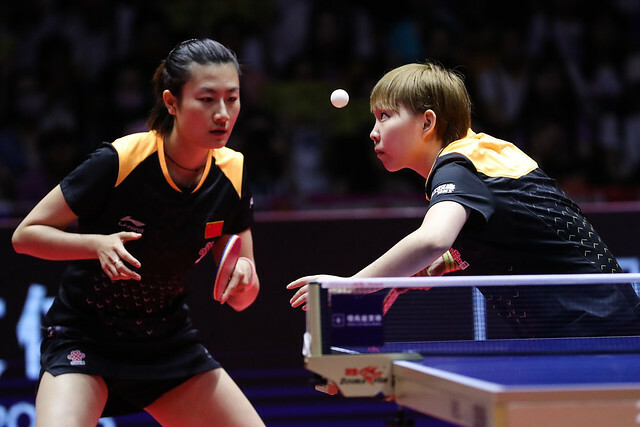 The first two games were shared; strong from the backhand, especially over the table with the first attack, Fan Zhendong made the better start; he duly secured the opening game. Conversely, active, Ma Long replied to win the second but not after he had given his supporters some nervous moments; he went ahead 8-4, then lost the next four points before winning three in a row to clinch the game. Again in the third game, Ma Long established a lead, he moved ahead 9-3; this time there was no Fan Zhendong recovery; Ma Long surrendered just one more point, he held the lead. Safe from the backhand, able to absorb the attacking endeavours of Fan Zhendong and when the chance arose lethal from the forehand, Ma Long dominated the fourth. Fan Zhendong continually under pressure made mistakes; he was not able to find the form of the opening game. A response from Fan Zhendong was needed; the response came. In the fifth game he went ahead 6-2, Ma Long reduced the gap to one point at 6-5; understandably with one service in the sequence of two remaining, Fan Zhendong called “Time Out”. Fan Zhendong won the next point before Ma Long levelled at 8-all; but at 10-8 it was two game points in favour of the top seed. Ma Long saved both game points, before saving two more. At 13-12 he held his first opportunity. He duly converted, the title was secured. Success and success for the seventh time in a Men’s Singles title at an ITTF World Tour tournament in China but the first time in Shenzhen. Previously he had won three times in Suzhou, twice in Chengdu and once in Changchun. Overall, he now appeared in 38 ITTF World Tour Men’s Singles finals and has won 26 times; he is just one win behind the all-time leader Vladimir Samsonov of Belarus. Meanwhile for Fan Zhendong, who won earlier this year in Hungary and Qatar, it was a 15th such final; his fifth when finishing the runner up. Notably of those silver medals, four have now been when facing Ma Long. He was beaten by Ma Long in the final in Qatar in both 2016 and 2017, as well as in the latter year in Japan; in Shenzhen it was déjà vu.